The dogma of the Holy Trinity is the foundation stone of all Christian Theology. By it, One God exists in Three Persons and One Substance. This doctrine is considered to be a mystery, that is, it can neither be known by unaided reason apart from Divine revelation, nor can it be convincingly demonstrated by reasoning processes after it has been revealed. "...baptizing them in the name of the Father and of the Son and of the Holy Spirit"
The New Testament teaching of the Trinity was taken by the Church and expressed in Creeds, Doxologies and confessions of faith. The 1st and 2nd Ecumenical Councils, at Nicaea in 325 and in Constantinople in 381, defined the dogma of the Trinity in its simplest but correct form. 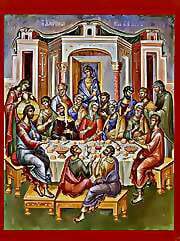 The Feast of the Holy Trinity is celebrated each year on the Monday after Pentecost. From its humble beginnings the Parish has grown steadily and has expanded its ministries in any and all areas needed by those who call Holy Trinity - St. Nicholas their home. Blessed are You, O Christ our God, You Who made the fishermen all-wise, having sent down upon them the Holy Spirit; and by them did draw the world into Your net; O Merciful Lord, glory to You.